February 1st always means one thing on Turner Classic Movies: It's time for 31 Days of Oscar! 31 Days of Oscar runs through March 3rd. TCM has created a special microsite with complete details about this month's schedule. The February schedule may also be found here. This year the movies are grouped by themes, ranging from "Best Battle With the Bottle" to "Favorite Swashbuckler" to "Courtroom Dramas" and so on. Here are recommendations of a few favorites among the many great films airing this month. Click any hyperlinked title for my full review. ..."Edge of Your Seat" films on February 2nd include PANIC IN THE STREETS (1950), which won the Oscar for Best Story. Richard Widmark and Paul Douglas star as a doctor and a cop trying to prevent the spread of a lethal disease in New Orleans. I was glad to revisit this film on a big screen at the 2015 Arthur Lyons Film Noir Festival and recommend it as an interesting and engrossing film. 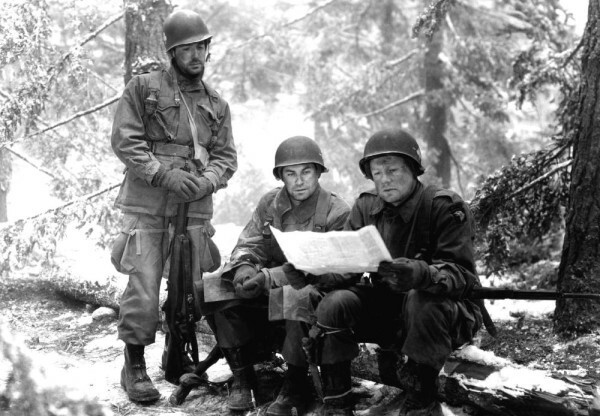 ...The lineup on February 4th includes the films which won Best Cinematography in 1949, SHE WORE A YELLOW RIBBON (1949), which won for color filming, and BATTLEGROUND (1949), which won the honors for black and white. 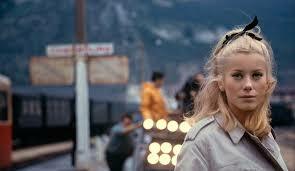 Both films have some of the greatest cinematography not just from 1949 but ever. ...It doesn't seem as though LOST HORIZON (1937) turns up on TCM very frequently. It's part of a day of fantasy films on February 6th. Ronald Colman stars in Frank Capra's classic, with a superb supporting cast. I first saw this film in an L.A. revival theater as a teenager and it made a huge impression. ...February 7th might be my favorite day on the schedule. First it pairs up two Joseph L. Mankiewicz movies, ALL ABOUT EVE (1950) and A LETTER TO THREE WIVES (1949), followed by my two all-time favorite swashbucklers, THE MARK OF ZORRO (1940) and THE ADVENTURES OF ROBIN HOOD (1938). 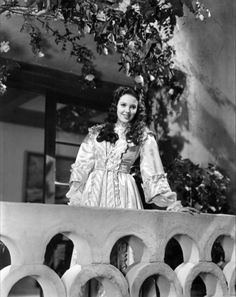 You cannot go wrong watching any of these films -- two of which star the marvelous Linda Darnell (seen here in ZORRO). I would also note that it's great to see so many films from 20th Century-Fox on TCM; of these films only ROBIN HOOD wasn't released by Fox. ...Last summer I saw Ernst Lubitsch's NINOTCHKA (1939) for the first time in many years and had a great time. It's on February 8th. Greta Garbo ("Garbo laughs!") and Melvyn Douglas star. ...Last year I was also able to revisit ROMANCE ON THE HIGH SEAS (1948), in which Doris Day sang the Oscar-nominated "It's Magic" and became a movie star. It will be shown February 10th. 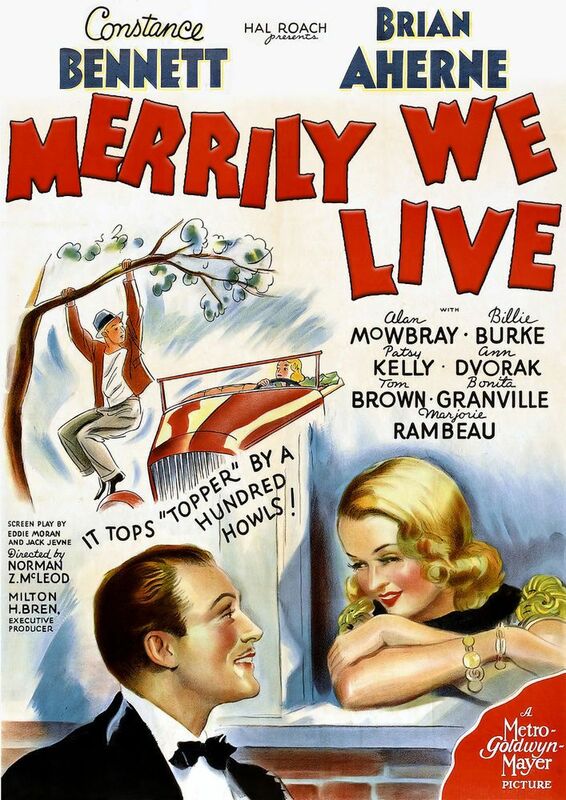 ...February 12th features the wonderful screwball comedy MERRILY WE LIVE (1938), a film which should be much better known. I saw it for the second time a few months ago and came away even more impressed than the first time I saw it. Billie Burke steals the show in an Oscar-nominated Best Supporting Actress performance. Be sure to catch it -- smiles guaranteed. ...I saw Roy Rogers in his star-making film UNDER WESTERN STARS (1938) at the Lone Pine Film Festival last fall. The presentation of the Oscar-nominated song "Dust" is memorable, and the score also includes "Listen to the Rhythm of the Range." 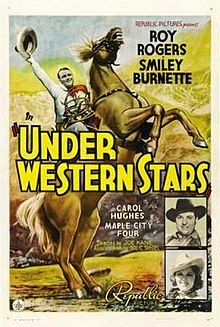 UNDER WESTERN STARS will be shown on February 13th. ...George Cukor's superb version of LITTLE WOMEN (1933) airs on February 15th, with Frances Dee, Katharine Hepburn, Jean Parker, and Joan Bennett starring as Meg, Jo, Beth, and Amy. ...THE NAKED SPUR (1953), a Western which was one of James Stewart's many collaborations with director Anthony Mann, will be shown on February 16th. ...It's impossible to see MEET ME IN ST. LOUIS (1944) too many times! Catch it on the 17th. 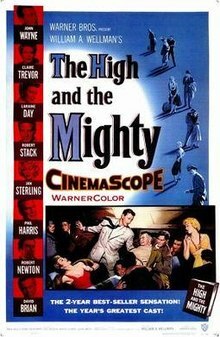 ...It's been a long time since I took a look at THE HIGH AND THE MIGHTY (1954), William Wellman's aviation suspense film starring John Wayne. It will be shown on February 20th. ...John Huston directed both 1948's Best Supporting Actor, Walter Huston in THE TREASURE OF THE SIERRA MADRE (1948), and Best Supporting Actress, Claire Trevor in KEY LARGO (1948). They'll be shown back to back on February 23rd. ...A terrific day of romantic comedies on February 25th includes THE TENDER TRAP (1955), which was nominated for Best Song. It's hard to believe it didn't win until you look at the competition, which included "Something's Gotta Give," "Unchained Melody," and the winner, "Love is a Many-Splendored Thing." Those were the days of great movie music. 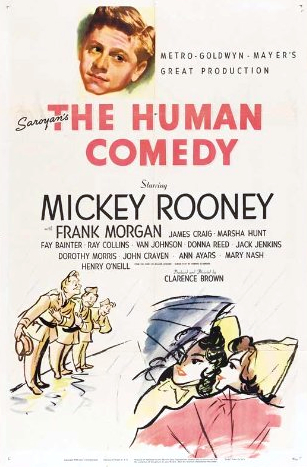 ...THE HUMAN COMEDY (1943) is a superb exemplar of MGM 1940s Americana. Mickey Rooney was deservedly nominated for Best Actor and the film was nominated for Best Picture. William Saroyan won the Oscar for Best Story. His book used to be taught in California public schools, and it's a great shame it was dropped from the curriculum. I made sure my homeschooled children read it. THE HUMAN COMEDY will be shown February 27th. ...On March 31st one of the final films in the series is A MIDSUMMER NIGHT'S DREAM (1935), which I saw at last year's TCM Classic Film Festival. It was a magical experience. I recommend turning off the phone and turning down the lights to try to replicate the experience of seeing it in a theater, enveloped by the film's look and mood. For more on TCM in February 2019, please visit my post Quick Preview of TCM in February along with the online schedule or the 31 Days of Oscar 2019 microsite. A related note: This year's Academy Awards will be announced on February 24th. It's going to be a great month. Thanks for breaking it down as it is easy to get lost among all the titles. Thank you so much for sharing that link to your post on UNDER WESTERN STARS, Caftan Woman! (Great info that Carol Hughes was married to Frank Faylen.) My readers and especially Western fans should be sure to check it out! Do you know the name of the song that plays with the TCM February Lineup? The most likely name would be a refrain from the song that goes "you ain't got nothing if you ain't got me". I've look for the song online but with no luck. Thanks. I'm sorry, I don't know the name of it! Perhaps someone else who recognizes it can jump in and supply the answer.